Baking at Christmas time brings out my inner child and I love it! But I wish it would also bring out my inner artist… oh, that’s right, there’s no artist in there. Apparently, artistic talent skips a generation. My dad had it, and my kids do… but me? I got diddly-squat. What I do have is Christmas spirit, enthusiasm, willingness to try anything and a super fun cookbook I got for review with easy to make cakes for Christmas. 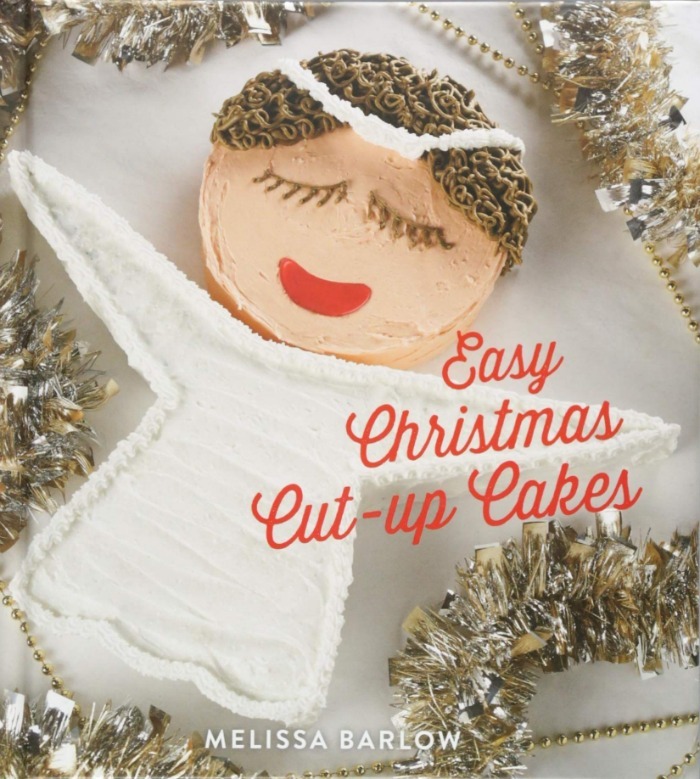 It’s called Easy Christmas Cut-Up Cakes, and it’s filled with holiday-shaped treats just right for all your Christmas parties. There are 24 holiday and winter-themed cakes in the book from which to choose, including a Christmas tree, toy train, Santa, Rudolph, penguin, snowman, wreath and more! Every one of them has a colorful photo of the finished cake design. And they truly are easy to make, because if I can make a fuzzy mitten cake, anyone can. To make the fuzzy mitten cake, pick your favorite box cake mix flavor and bake it in a 9 x 13-inch pan. No fancy pans or molds are needed. 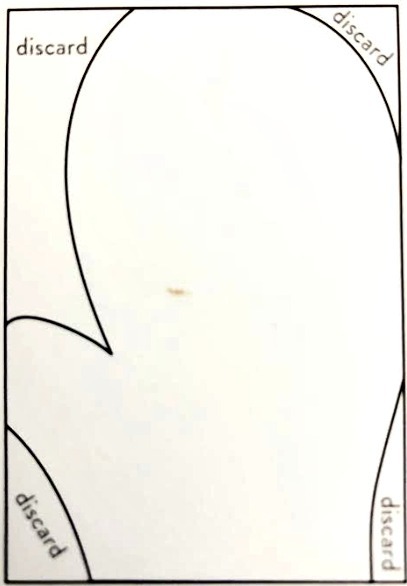 Let the cake cool, then cut away sections by following this template. 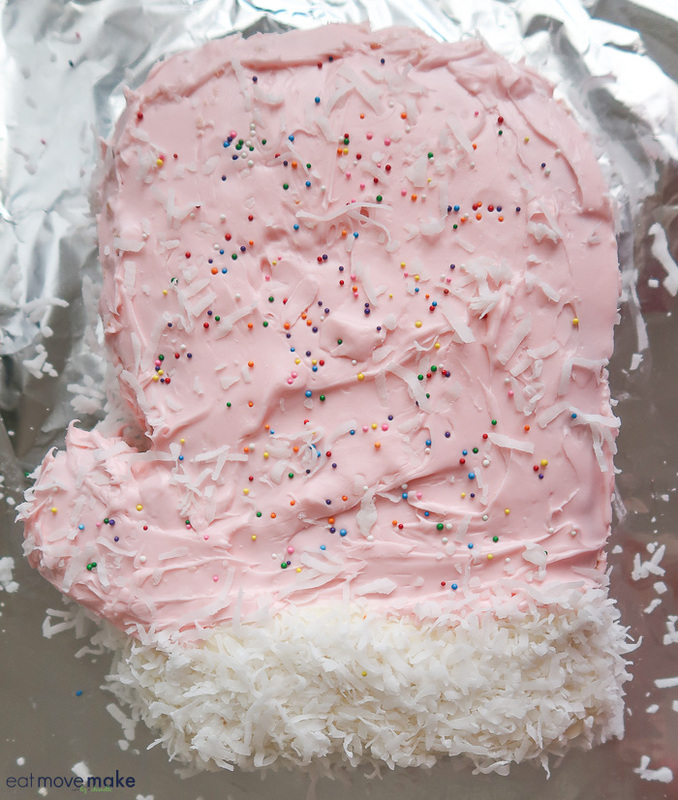 Sprinkle a heavy layer of sweetened shredded coconut over the white mitten bottom. 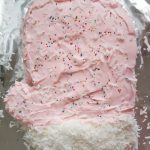 And lightly sprinkle coconut over the entire pink mitten. Finally, I strew some rainbow nonpareil sprinkles over the pink frosted area. And that’s all there is to it. 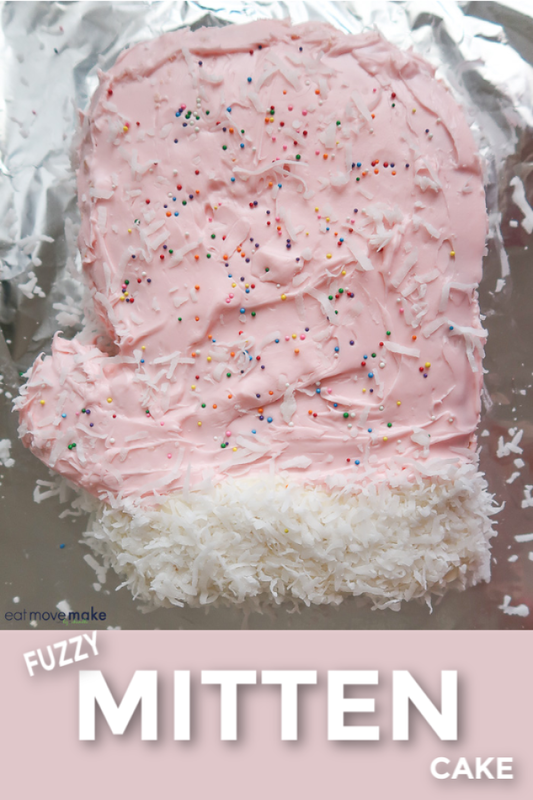 Pin the fuzzy mitten cake recipe! Preheat oven to 350 degrees. Grease a 9 x 13-inch pan with nonstick cooking spray. Make cake mix according to package directions. Pour batter evenly into pan. Bake for 27-32 minutes, or until a toothpick inserted in center comes out clean; remove from oven. Cool in pan for 10 minutes, then invert and cool completely on wire rack. Cut cake according to diagram and place mitten on a large serving platter or foil-wrapped board. Discard (or eat!) the leftover cake pieces. Frost a strip across the bottom of the mitten with white frosting and frost the rest of the mitten pink. 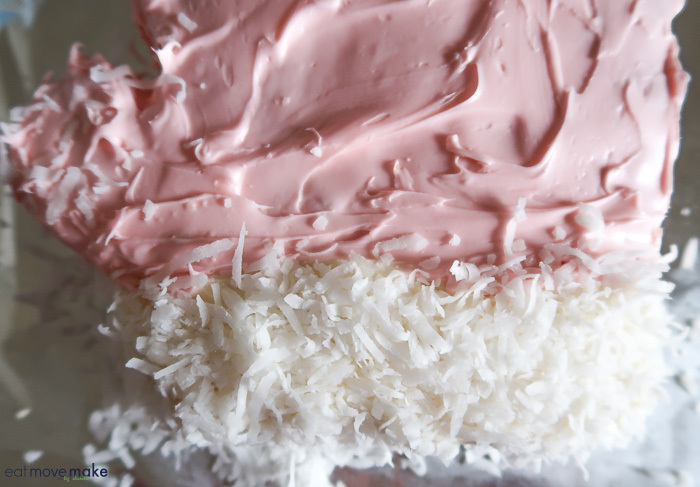 Completely cover the white frosting with the coconut, pressing lightly to secure. 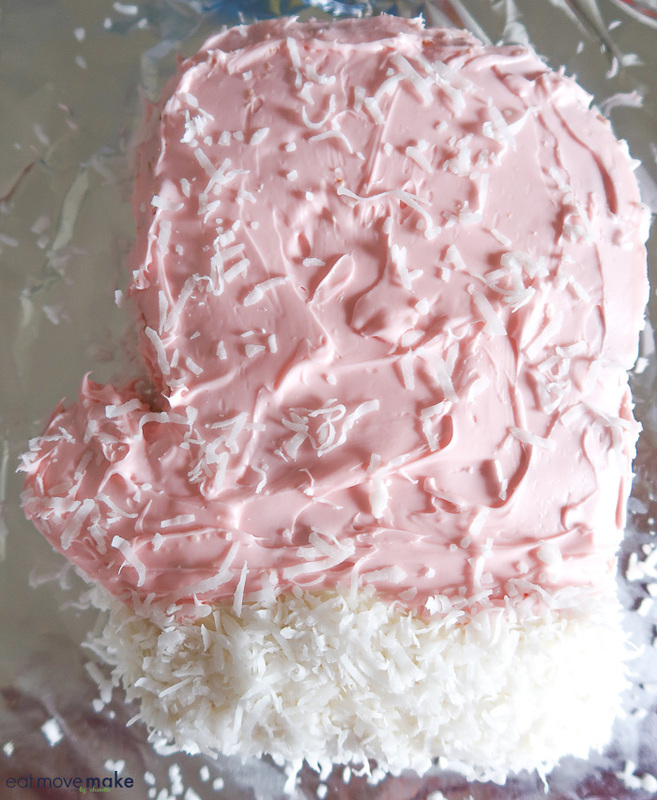 Lightly sprinkle more coconut and nonpareils over the pink frosting. Get your copy of the book here and decorate your table for the holidays and beyond with this fuzzy mitten cake or any of the other winter-themed yums!